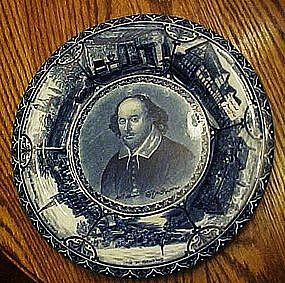 Take a look at this wonderful old flow blue souvenir plate with center pattern of William Shakespeare and different scenic sights on the rolled edge of Stratford on Avon and Shakespeares house. Measures 10" in diameter and is in perfect condition with no chips, or cracks of any kind. Stamped on the back Shakespeare with a crown logo and SH&S England and the registered number. I have a photo of the backstamp if you need to see it.